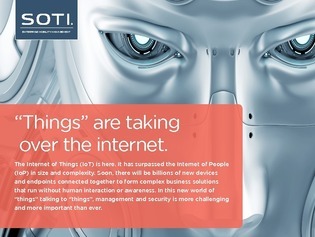 The Internet of Things (IoT) has arrived in most enterprises, surpassing the Internet of People (IoP) in size and complexity. With billions of new devices and endpoints connected and running together without human interaction or awareness, management and security is more challenging—and therefore more critical—than ever. In this white paper, learn how the Internet of Things is shaping the evolution of business mobility and the importance of implementing heightened security. Read on to access the top five considerations for managing IoT for modern IT, and more.